The Curve Combination Wardrobe is storage made simple with two doors, one drawer and ample hanging space crafted from a solid white oak with oak veneers. Constructed with high quality materials and manufactured to make storage stylish, the Curve Combination Wardrobe is perfect for anyone looking to add a modern elegance to their bedroom. The dashing design combines clean lines with round edges to add a splash of contemporary style to a well-constructed product built to endure. High quality solid white oak combined with oak veneers and waxed oak finishing gives the Curve Combination Wardrobe sturdy properties and a fashionable exterior. Recessed handles allow ease of access whilst adding secrecy to your storage solutions. The simple yet elegant design is cleverly crafted to ensure de-cluttering and organisation whilst filling your bedroom with style to spare. 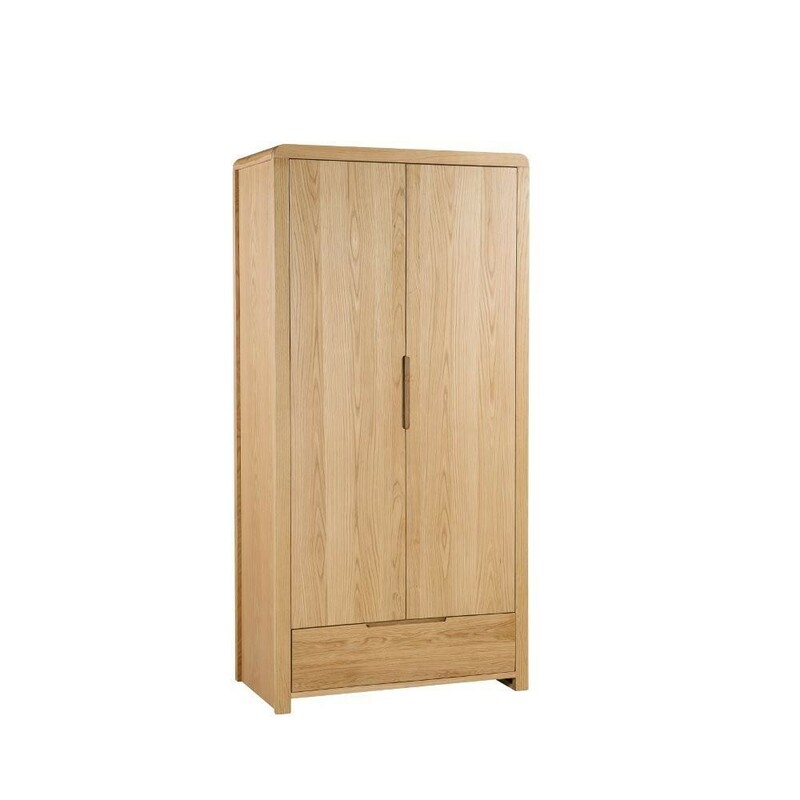 The Curve Combination Wardrobe consist of two solid white oak doors hiding plenty of ample hanging space to organise your belongs as you wish. With storage in excess above, there is also a spacious solid wooden drawer beneath to use at your leisure featuring dovetail joints. The hanging option allows room to categorise belongings to ensure convenience and ease of access when completing day-to-day tasks. All the discrete storage features are stylishly hidden behind a stunning waxed oak finish and complemented by crafted curved edges and crisp modern lining. Self-assembly is made easy with the Curve Combination Wardrobe through clear instructions provided with purchase and available to access online at any time. The Curve Combination Wardrobe stands at 190cm x 93cm x 52cm ensuring plenty of storage space whilst still ensuring maximum floor space in your bedroom.